ThreeJars Daily: Can Money Buy Happiness? They say money can’t buy happiness…or can it? Recent research by Elizabeth W. Dunn, an associate professor at the University of British Columbia suggests that spending money on certain things, like experiences that bring people together, make you happier. So forget the new carpet, and spend your cash on these family activities that seriously pay off. Kids have always known how cool it is to camp in the backyard—so why shouldn’t the whole family get in on it? Set up tents, and roast marshmallows and hot dogs in a fire pit (buy one at the end of the season and save big). 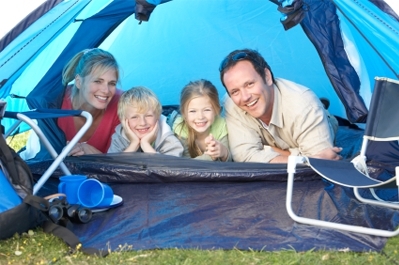 Watch for sales on camping equipment, and invest in some cool gear to make your stay-camping deluxe and authentic. Your kids will totally forget the house is a few feet away. You know all those excursions in town you only splurge on when out-of-town friends come to visit? Get out there and enjoy them with your family, then cap the day off with a meal at a nice restaurant the whole family loves. Take tons of pictures and videos, and follow up with a family “documentary” night, where everyone can play a part in preserving the memories. Before the weather turns cold, do family movie night under the stars. All you really need is a sheet fixed to the house siding or other outdoor structure, a projector (these can be rented), and maybe some extension cords. String holiday lights in the bushes and trees for atmosphere, and spread blankets on the grass. A busy preschooler can man the “concession stand” (a cooler and picnic basket full of treats) if she’s not up for sitting still for a feature film. Pull out your family’s favorite games—but throw down for a few new ones too, to keep the play fresh and challenging. Make it a regular event and potluck, inviting friends to participate and bring snacks. Keep a scoreboard of winners, and award cool prizes, like gift cards and cold hard cash.